Live large in this gorgeous 6-bedroom pool home situated on a scenic heron pond with private views across acres of Intracoastal tidal marshland. 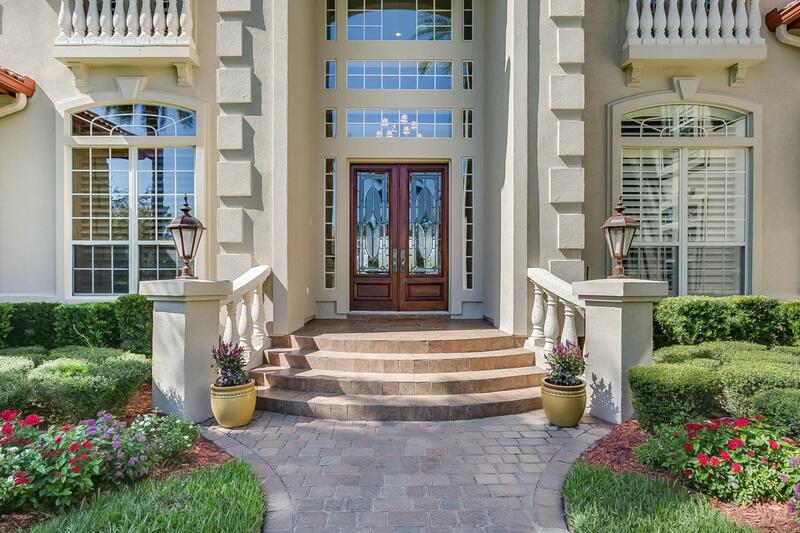 Through elegant double leaded-glass doors awaits a grand 2-story foyer awash with a sea of travertine flooring that continues through all social area and into the handsome study/den showcasing a wall of rich built-ins. Past the open dining room and living room that overlooks the pool, awaits a truly "great" great room. This expansive area includes a window-filled gathering room with a gas fireplace surrounded by built-ins that include all audio/video equipment. The favorite social area is totally open to the gourmet kitchen with 2 islands, food prep plus an island with an expansive 6-seater bar & an adjoining L-shaped wet bar with beveragefridge & bar seating and a delightful breakfast area viewing the pool. The granite kitchen is fitted with stainless steel appliances that will delight any cook: 6-burner Thermador gas cooktop, Thermador double wall ovens & microwave, 48'' built-in fridge & Bosch dishwasher. The walk-through butler's pantry, connecting the kitchen to the dining room, has an abundance of cabinetry, a 2nd Bosch dishwasher & U-Line ice maker. The wine cellar with commodious wine racks & wine refrigerator is conveniently nearby. A sumptuous 1st floor master wing includes a huge bedroom, which shares a 2-sided fireplace with the sitting room, & opens to the screened lanai & pool. Commodious his & her closets are fitted with custom fixtures & the spa bath features gleaming stone flooring, a whirlpool tub, walk-in shower, miles of cabinetry, a separate ladies makeup vanity, water closet with bidet. Completing the 1st level is a full pool bath leading to the lanai & pool, a guest suite with en suite bath, computer alcove with planning desk & laundry room with a door to the exterior, ideal as a family entry and for deliveries. Upstairs is another computer alcove with built-in desks, 3 additional large suites with walk-in closets & bedroom 6 (now decorated as a game room with billiard table), which opens to a covered balcony that presents breathtaking views across pristine saltwater marshland to the Intracoastal Waterway.